Normal services have resumed after a brief foray down South. We’re back in the North – hurrah!!! So where do you go on a rainy Saturday afternoon in Manchester? Not far for sure. So after a short trip over the M60 ring road we visited Sale. Sale is a nice little suburb in south Manchester. Sale is a part of Trafford Council, one of the rare Conservative controlled areas of Greater Manchester. The Trafford borough is an area of extremes from the uber wealthy areas of Hale and Bowdon compared to the down-at-heel areas such as Old Trafford and Stretford. Sale firmly fits in-between them – a middle class neighbourhood with chav elements from Sale West and Northern Moor. We have quite a bit of a back history with Sale. Neil lived there as a kid. My best mate lives there. 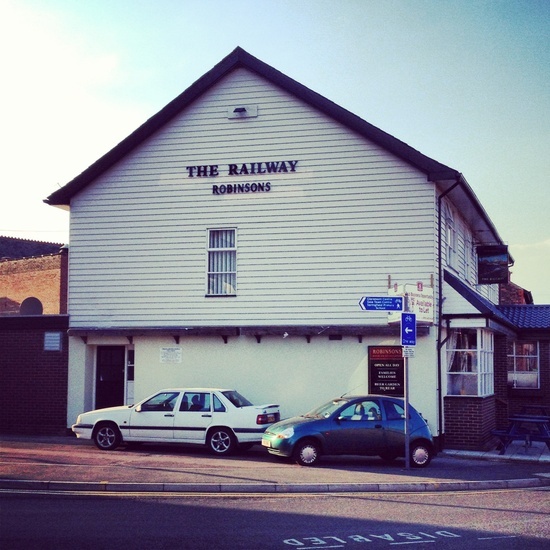 More recently, for the last 14 years, we’ve been regulars at the Pop Quiz at the Railway Pub. One of the plus points of choosing Sale as a place to visit is that it has a really good range of charity shops. The charity shops are in close vicinity to each other so it’s very easy to ping-pong from one to another. Sale charity shops are firmly mid-range, with an interesting selection of books. I picked up a copy of ‘Girl,Interrupted’ by Susanna Kaysen. It’s a cracking read and I would definitely recommend it as an insight into mental illness. Neil has found it rather miss than hit for record finds. Although Marc Riley, a 6 Music DJ, used to trawl these shops for a feature on the short lived, but much loved radio show ‘Mint’. The rest of the shops on the pedestrianized main street and precinct are fairly high street and predictable. The precinct is one of those 1970s concrete style uninspiring numbers, whilst the pedestrianized high street is a mix of new and Victorian buildings. Unfortunately the recession has hit here and there were a number of empty shop fronts. Textile Direct were having a closing down sale and I picked up a few bargains. The main supermarket in the town is Sainsbury’s. Although word of warning, the car park can be very busy and much to my annoyance car accidents can occur – long story. So watch out. There is a Marks and Spencer’s food shop which is rather handy. Although I hope they have sorted out the air-conditioning as it could be Siberian in the height of summer. Parking in Sale is very controlled. Private housing is very close to the town centre and as a result they run a residents permit scheme. Although you can, if you are lucky, find two hours free parking. Otherwise there’s on-street metered parking, multi-storey or paid parking at the local supermarkets. They are pretty hot for parking control in Sale, so follow the restrictions. The great thing about Sale is that it’s on the Metrolink tram line. I reckon it takes about 20 minutes to get from Manchester city centre to Sale. Although the line does pass nearby to Manchester United’s ground, so on a match day the Metrolink can be hellish. So it’s worth checking out the times of the matches. The same goes for Lancashire Cricket ground, but they have a much nicer clientele. The biggest drawback to the tram link is that it’s too closes to the canal. At night you can see some of the canal’s furry residents scurrying about. The canal cuts through the centre of Sale and you find lots of barges parked up here. If you are thinking of taking a canal holiday, definitely stop off here. There is the King’s Ransom pub on the canal side. The locals use the canal pathway for jogging and dog walking. It’s a lovely place to get respite from city living too. There are plenty of restaurants in Sale. We tend to frequent the Massala Lounge for our Quiz related meals out. It’s pretty good. There used to be a fantastic Spanish restaurant in the early 2000s, but sadly that’s closed. I would check out Tripadvisor for current recommendations. A few coffee shops such as Café Nero and Costa have sprung up in recent years, which confirms Sale’s status as a nice neighbourhood. We, well Neil more than me, are regulars at the Sale Pop Quiz at the Railway pub. 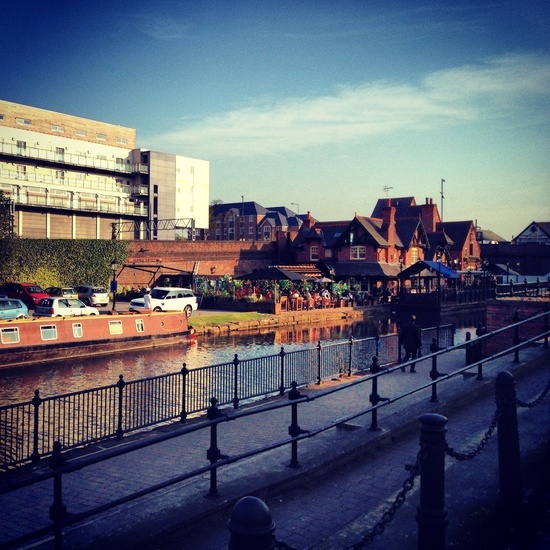 The Railway is a down-to-earth pub near the canal, which cuts through the town. A few years back it had a well needed makeover, although it does still attract the odd nutter – now that is too long a story. John, the barman is fab. It’s a dog friendly pub too. Shilling, a dog of indeterminate origin, is known to go begging round the tables for crisps and pork scratching’s. Recently there was a gorgeous sheepdog and German Shepherd cross who kept carrying its ball around the pub – much cuter than Shilling. Word of warning about the Tuesday night pop quiz – it’s hard, really hard. The quiz consists of many short music clips rather than music trivia. Unless you are really good, like a music genius, don’t bother. Seriously, it’s hard stuff and for some bizarre reason the only things I’m quite good at recognising are 1950s intros. A real draw to Sale is the Waterside Arts Centre. I remember when it was just a dodgy car park, but the Council have managed to transform it into an Arts and Council services centre with a nice canal side walkway. It also has restaurants and a large bar. I’ve only been to the art gallery bit and that was lovely. We must check out a gig there someday soon. There are some chav / nutter elements to Sale, but that is to be expected with some of the tough council estates on the Sale borders. All-in-all I think Sale is ace and worth a visit. Make sure you pop into the Railway to say hello to John and have a pint. It may not be the classiest pub in Sale, but it’s one of the friendliest.